"A storm at sea - a ship is broken by the waves, and a king and his court are washed up on the shore of a mysterious island. The desolate isle appears uninhabited but, unseen in the shadows, a powerful magician plots his revenge. The fate of all the shipwrecked souls now rests in his hands. Will he give in to his anger, or will his love for his daughter redeem them all? 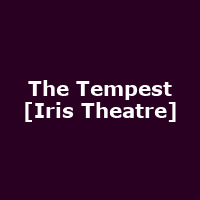 Inspired by the courtly royal masques of the 17th century, and the designs of Inigo Jones, The Tempest is an evening of pomp and promenade, of magic and illusion."